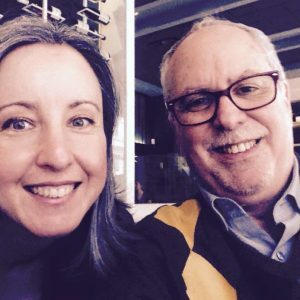 Elizabeth Moore and Bernie Farber in February 2015. Elizabeth Moore is a respected speaker and educator on racist extremism in Canada. In 1995, at the age of 21, Elizabeth defected from The Heritage Front with the help of Bernie Farber and the Canadian Jewish Congress. Elizabeth has contributed to numerous anti-Fascist education initiatives, reaching millions with her story of personal change. In 1998, her life inspired the award winning CBC drama, White Lies, starring Sarah Polley and Lynn Redgrave. (See Projects and Speaking for more information). Elizabeth stepped back somewhat from her activism work in the mid-2000s during a period of relative peace, in order to focus on building her career in lifestyle television. She also earned an MFA in documentary media from Ryerson University. However, in these most troubling of times, Elizabeth believes everyone must step up and fight the groundswell of racist extremist activity. 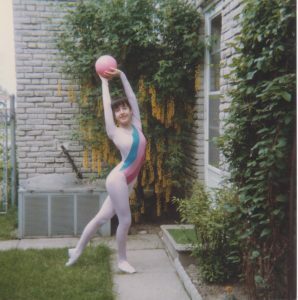 Elizabeth Moore, age 15, preparing to perform in the SkyDome Opening Ceremonies. Elizabeth Moore was born and raised in Scarborough, Ontario. While attending high school, she was introduced to the white supremacist group, The Heritage Front. Moved by feelings of anger and ignorance about the racial, cultural and economic tensions in her school, she embraced the racist-right. However, once Grant Bristow was found to be a CSIS agent, and all of the Front’s dirty laundry was aired in public, her view of the racist movement slowly began to change. After much soul searching, and with the assistance of Bernie Farber and the Canadian Jewish Congress, Elizabeth cut ties with the racist right. Since then, Elizabeth has participated in numerous anti-Fascist education initiatives, reaching millions. (See Projects for more details). White Lies is based on Elizabeth Moore’s life. In 1996 Dennis Foon and Phil Savath approached Elizabeth with the idea of making a fictionalized film about her experiences. She agreed, feeling this was an excellent opportunity to educate a mass audience about the dangers of hate groups. Elizabeth contributed multiple extensive interviews with writer, Dennis Foon, consulted on scripts and wardrobe and provided background information for some of the actors. The International Emmy and Gemini finalist, White Lies, starring Sarah Polley and Lynn Redgrave, aired on CBC television across Canada in 1998. Elizabeth regularly speaks to school and community groups, and to the media about her experiences. She feels that educating people is the best way for her to give back to the community and welcomes the opportunity to participate in programs and projects. 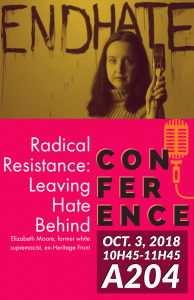 Elizabeth Moore has worked on anti-racist films, multimedia educational initiatives, and contributed to textbooks and a government report in an effort to educate people about the dangers of hate groups. 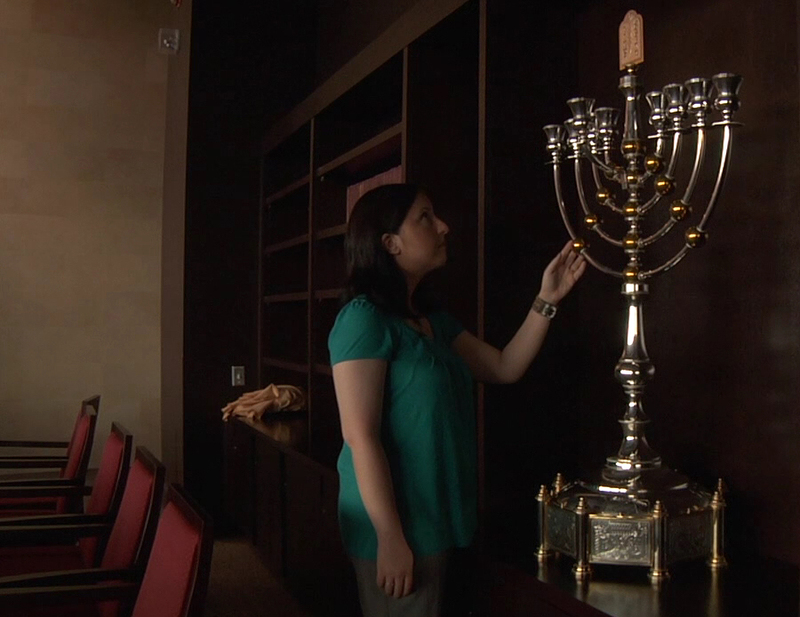 Her most recent film, In God’s Keeping, is a personal exploration of her past as a Heritage Front spokesperson, and her possible future as a convert to Judaism. Elizabeth is currently exploring new ideas and developing avenues to continue her educational and artistic endeavors. If you would like to collaborate, please contact her! PUBLICATION: Book chapter. (Details forthcoming). WEB RESOURCE: (In development. Expected launch, summer 2019). PANEL ORGANIZING COMMITTEE MEMBER: Stolen Childhood, Stolen Identity: The Lasting Shadow of Jewish and Indigenous Traumas. Enhancing Social Justice in Education Committee. Holocaust Education Week, Toronto, November, 13, 2018. PUBLICATION: Calling out hate groups doesn’t ‘give them oxygen’ — it prevents the hate from festering. Elizabeth Moore. Maclean’s Magazine, August 8, 2018. PUBLICATION: Alexandre Bissonnette’s loved ones missed the signs. We can’t make that mistake again. Elizabeth Moore. Maclean’s Magazine, April 20, 2018. PUBLICATION: Deradicalizing Racist Extremists. Elizabeth Moore. Educational brochure for the Ontario Ministry of the Attorney General 2018 Hate Crime Training Conference. March, 2018. DOCUMENTARY: In God’s Keeping. Directed by Elizabeth Moore. April, 2011. Elizabeth Moore contributed a chapter to this textbook. PUBLICATION: Turning Away from Hate. 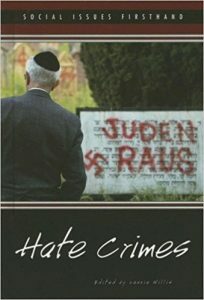 Societal Issues Firsthand: Hate Crimes, edited by Laurie Willis. Greenhaven Press (Imprint of Thomson Gale), 2007. PUBLICATION: In Her Own Words: Confessions from a Former Neo-Nazi. Philosophy in Action: Teacher’s Guide, edited by Wayne Sproule. Fitzhenry and Whiteside. 2004. PUBLICATION: Competing Perspectives: Does the Heritage Front organization promote hatred in Canada? Yes: Elizabeth Moore: Her Story, In Her Own Words. Transitions in Society: The Challenge of Change. Edited by Colin Bain, Jill Colyer, Dennis DesRivieres, Sean Dolan. Oxford Canada, 2002. FILM CONSULTANT: White Lies. Directed by Kari Skogland, CBC Television, March 29, 1998. PUBLICATION: Exposing the Lie: Responding to Hate Groups in our Community. Commissioned by the Queen’s Human Rights Office and The Social Issues Commission. Anti-Racist educational brochure. September, 1997. CONSULTANT: Heritage Front Plan of Action Anti-Racist Meeting, Queen’s AMS, Queen’s Hillel, Kingston Police Department, September 1997. PUBLICATION: Elizabeth Moore: Her Story in Her Own Words. From Marches to Modems: A Report on Organized Hate in Metropolitan Toronto. Commissioned by the Access and Equity Centre, The Municipality of Metropolitain Toronto. January, 1997. PUBLICATION: On Racial Hatred. Elizabeth Moore, The Queen’s Journal, October 3, 1995. Elizabeth Moore is a respected educator and speaker. She feels honoured and privileged to share her experiences — and the lessons she’s learned about hatred — with audiences across the country. Speaking engagements are a key way she gives back to the community. If you have an upcoming event you’d like Elizabeth to participate in, please contact her. Keynote: BBYO, Global Shabbat, Toronto. December 7, 2018. Speaker: Professional Development Seminar, conducted by the Canadian Anti-Hate Network. David and Mary Thomson C.I., Scarborough. December 7, 2018. Panelist: Holocaust Education Week, Queen’s University, Kingston. November 12, 2018. Guest Speaker: Grade 12, Challenge and Change class. St. Roch Catholic Secondary School, Brampton. November 1, 2018. Guest Lecturer: “Radical Resistance: Leaving Hate Behind.” York University, Glendon College Communications Department. October 3, 2018. Speaker: “Domestic Extremism and Hate Groups in North America.” York Regional Police in partnership with the Southern Poverty Law Center and The Canadian Anti-Hate Network. May 17, 2018. Keynote: The Ontario Ministry of the Attorney General’s 2018 Hate Crime Training Conference. March 7, 2018. Speaker: “Racism: A Challenge to Us All.” Holocaust Education Week, Temple Kol Ami, Thornhill. (50 attendees). November 9, 2003. Speaker: “Racism: A Challenge to Us All.” Holocaust Education Week, Sons of Jacob Congregation, Belleville. (20 attendees). November 3, 2003. 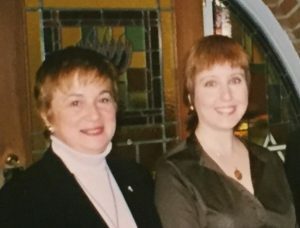 Elizabeth Moore with Karen Mock at Help Halt Hate in 2003. Panelist: “Help Halt Hate.” UJA Federation Women’s Campaign And Advocacy Group. (Approximately 400 attendees.) October, 2003. Speaker: “Racism: A Challenge to Us All.” Holocaust Education Week, Bathurst Clark Resource Library, Thornhill. (40 attendees). November, 5 2002. Keynote: Holocaust Education Symposium, Mohawk College, Sponsored by the Holocaust Education Committee of Hamilton, Mohawk College, McMaster University, and the public and Catholic school boards, May 16, 2002. Keynote: “The 13th Annual Student Seminar on the Holocaust.” The Waterloo County Holocaust Education Committee. (400 attendees). May 2002. 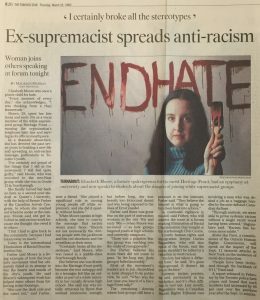 Elizabeth Moore was featured in the Toronto Star ahead of an anti-racism forum. Panelist: Forum marking International Elimination of Discrimination Day. March 21, 2002. Panelist: “When to Speak Out, When to Remain Silent.” CJC 30th Ontario Regional Plenary Plenum. (250 attendees). November 28, 1999. 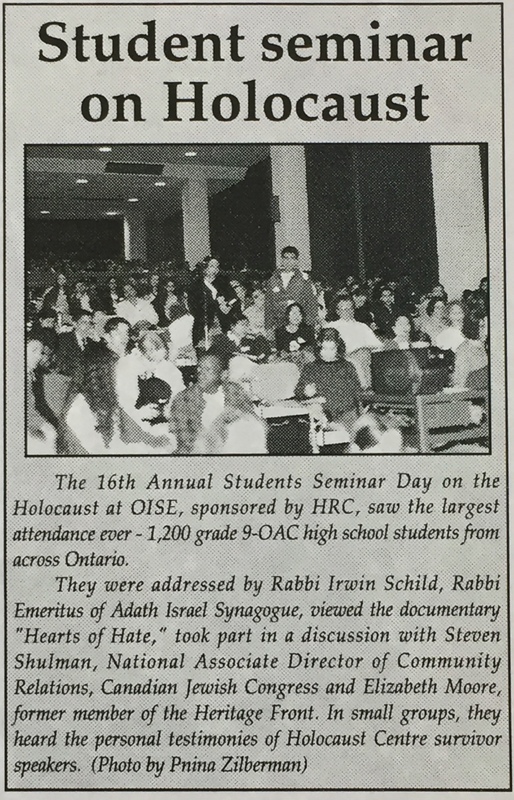 Keynote: Screening of “Hearts of Hate.” Eracism Week, Queen’s University, November 17, 1997. Keynote: “Racism is Knocking at Your Door.” Norman Rothstein Theatre, JCC. Young Adults Division of the Jewish Federation of Greater Vancouver. (200 attendees). June 6, 1996. Panelist: “16th Annual Student Seminar Day on the Holocaust.” The Holocaust Education Centre (?) & OISE. (1,200 attendees). May 1, 1996. 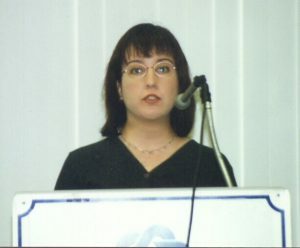 Elizabeth Moore, speaking as part of a panel at a CJC Plenary in 1999. Panelist: “Hearts of Hate: The Battle for Young Minds.” Screening of the film and panel discussion with Peter Raymont, Bernie Farber, and Elizabeth Moore. Generation to Generation Sub-Committee of the Holocaust Remembrance Committee, The Jewish Federation of Greater Toronto, The North York Board of Education. (150 attendees). February 22, 1996. Panelist: “Racism & Xenophobia: Recognizing the Danger Signals.” The 15th Annual Seminar on Teaching The Holocaust. November 30, 1995. Panelist: “Resisting Hatred: Rejecting The Roots of Intolerance.” St Lawrence Centre Forum & the City of Toronto. (350 attendees). November 23, 1995. Keynote: “Movie Night/Discussion: “Higher Learning,” Discussion with Elizabeth Moore.” Etherington Auditorium, Queen’s University. Eracism Awareness Week, The AMS Committee Against Racism and Ethnic Discrimination, November 6, 1995. Keynote: “Hearts of Hate” Screening. Ellis Auditorium, Queen’s University, March 3, 1995. Want to contact Elizabeth Moore? You know what to do!